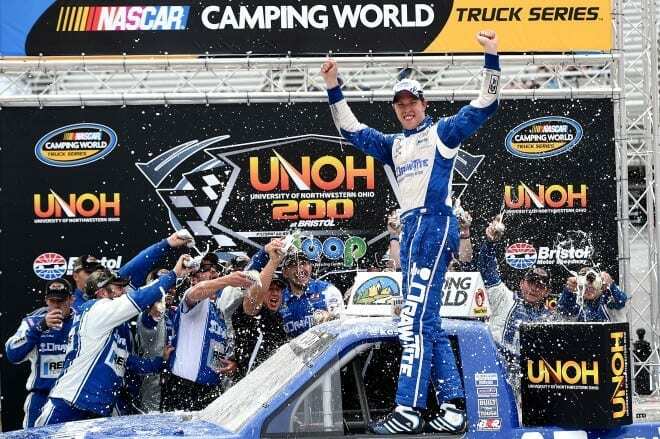 In a Nutshell: After finishing runner-up five times in the Camping World Truck Series, Brad Keselowski finally scored his win in his 62nd career start in the rain-delayed UNOH 200 presented by ZLOOP on Thursday morning at Bristol Motor Speedway. Keselowski led three times for a race-high 119 laps en route to a 0.776 second victory over Darrell Wallace, Jr. Ron Hornaday, Jr., Matt Crafton and Johnny Sauter rounded out the top 5.
Who Should Have Won: Keselowski and Kyle Busch were easily the class of the field, as they are in most races they enter. But it was the driver of the No. 19 Ford that took advantage of a late-race restart and a mishap by Busch, who rarely makes a mistake in the Truck Series, that managed to hold the top spot, despite a hard-charging Wallace, who kept pulling up to the leader as he negotiated lapped traffic. Justin Boston Makes Truck Series Debut Venturini Motorsports and ARCA driver Justin Boston made their Truck Series debut on Thursday morning at Bristol Motor Speedway. Forced to qualify on speed in one of the few full fields this season, Boston scored a 27th-place starting position. Due to his starting spot and the blistering pace leaders Busch and Keselowski were setting, the driver of the No. 25 ZLOOP / Geekbox Speakers Toyota was in danger of going a lap down early. But some hard driving allowed Boston to keep his nose just ahead of then-leader Keselowski to remain on the lead lap as the competition caution flew at lap 50. Having been given the chance to rejoin the back of the field, Boston actually worked his way inside the top 20 just a handful of laps later. But an incident involving John Wes Townley, Gray Gaulding and Brandon Jones pinched the debuting driver down into the inside wall. An innocent victim in the fourth and final caution of the day, Boston took his truck down pit road with what appeared to be only minor damage. As it turned out, according to the Venturini Motorsports Twitter feed, the No. 25 Toyota suffered a broken lower control arm that put him behind the wall, something the Fox Sports 1 broadcast failed to comment on even though its cameras were trained on Boston’s truck as he drove back there. The broken part relegated Boston to a 30th-place finish and a DNF in his first start. Had nowhere to go on that deal.. We never gave up and made gains all day. Proud of my @VenturiniMotor guys. The important thing for Boston to remember as he looks back on his Truck Series debut is that he was doing exactly what he needed to for his first time out. Though he would have liked to get a chance to run with the leaders and make something happen for the organization that has backed him so much in the last year and a half, Boston needed to just finish the race, while learning how his truck handled, and he most likely would have done that if he had had just a little more room to squeeze inside those wrecking ahead of him. Along with the remainder of the ARCA Racing Series schedule, Boston and Venturini Motorsports have plans to run the WinStar World Casino 350K at Texas Motor Speedway, the Lucas Oil 150 at Phoenix International and the season-ending Ford EcoBoost 200 at Homestead-Miami Speedway later this season. KBM Trucks Beat Themselves Kyle Busch Motorsports teammates Wallace and Busch shot themselves in the foot again this week. After both ran out of fuel at Michigan International Speedway, taking themselves out of contention, the duo over-drove their trucks trying to catch leader Keselowski late in the race. The driver of the No. 54 Toyota got loose late and barely scraped the wall, but his boss, Busch, hit the wall much harder, damage the left-rear corner and suffering a flat tire. The flat relegated the driver of the No. 51 Toyota to a 24th-place finish, six laps down. Meanwhile, Wallace managed to recover and make another run at the leader, thanks to lapped traffic in the closing circuits. But he got loose again and dropped back to nearly a second behind the eventual winner. The incidents suffered by both KBM trucks that were strong for most of the race mark back-to-back races where the organization actually looks vulnerable in a season where it’s clearly established itself as the team to beat. It’s nowhere near the end of the world for the team, and it will recover, but it takes out the invincibility factor that made the team seem almost untouchable earlier this year. * Having taken several races off since Kentucky Speedway earlier this season, Ricky Benton Racing and Corey LaJoie returned at Bristol. After starting 21st, the driver of the No. 92 Ford escaped Bristol with a solid 10th-place run, his first top 10 in just two series starts. * John Wes Townley returned to action, having missed two races following an ARCA crash at Pocono Raceway. After qualifying 23rd, Townley worked his way to right around the top 20 but was involved in a late-race accident. He ended up being credited with a DNF in 29th. * Brad Keselowski and his father Bob became the first father-son duo to win in the Truck Series. Additionally, Brad became the 25th different driver to win in all three of NASCAR’s national touring series. Note: Only drivers declared for the Rookie of the Year are eligible for the Rookie of the Race awards. Each week, we’ll take a look at the championship picture and find out which drivers were affected the most by the racing on track. Biggest Winner: Joey Coulter posted his third consecutive top-10 finish in the form of a seventh-place run at Bristol. After starting the season 29th in the standings, following a crash at Daytona, Coulter and the No. 21 team have been working their way forward ever since. In a season that started off slowly and didn’t see Coulter break into the top 10 until a fifth-place run at Dover, the No. 21 team has finished inside the top 15 in every race since. “It was a great day for us on the track and in the points,” Coulter said of his finish. “It was very much a come from behind day for us, and everyone stepped up to the challenge. The momentum that we picked up weeks ago still has us moving forward, and I expect it to stay that way through the end of the year.” The seventh-place run was good enough to move Coulter up two spots in the standings to seventh. He now sits 62 points behind the leaders. Biggest Loser: For the second week in a row, Ryan Blaney finds his way here. Last week, it was a faulty nose piece that cost him the points lead, and this week the No. 29 team struggled with the truck from the time it came out of the hauler. He ended up finishing 13th and dropped another spot in the standings. He currently sits fourth, 24 markers behind the leader. Points Update: By virtue of finishing just one position behind his teammate, Johnny Sauter maintains the point lead by eight markers over Matt Crafton. Ron Hornaday, Jr.’s third-place finish moved him up another spot to third, while Ryan Blaney dropped to fourth. Darrell Wallace, Jr. rounds out the top 5, 33 points behind the leader. German Quiroga remains sixth, followed by Joey Coulter. Timothy Peters and Ben Kennedy, who each dropped on position, sit eighth and ninth, respectively. Jeb Burton rounds out the top 10, 94 points behind Sauter. “[I] came over the radio and said, ‘I hate finishing second.’ I don’t care if it’s Brad (Keselowski), Kyle (Busch), (Matt) Crafton – I want to beat all of them. Congrats to Brad. Thought I could give him a run for his money. I was sitting there in the truck after the race just trying to replay everything and if I could have done anything different. I would have had to really piss him off and wreck him to get by him. Our Toyota Care Tundra was fast right off the get-go. Just saving tires and on that last restart we got on the top and got around Kyle – that was probably the highlight of the weekend. I’m proud of my guys. This is a good comeback from Michigan – should have been a one-two (finish). It’s alright, we’ll go on from this and we’ll build off this and we’ll go to Canada – crap, I have to remember how to turn right! We’ll have fun.” Darrell Wallace, Jr.
Up Next: The Camping World Truck Series heads to Canadian Tire Motorsports Park on Sunday, Aug. 31, for the Chevrolet Silverado 250. Last season, Nationwide Series standout Chase Elliott upset Ty Dillon with a last-lap punt that gave him his first career win. Race coverage begins at 1 p.m. ET on Fox Sports 1; it can also be heard on your local MRN affiliate. Seriously, who cares? It isn’t even racing. The truck series is just a playground for insecure Cup drivers. Nobody is watching. Hmmm… Keselowski’s truck was found to have the spoiler too high. Where are the calls for Bad Brad to be disqualified? But, before you do, dust the cobwebs out of your memory for a minute and remember the Dover Cup race from September of 2005. Jimmie Johnson and Kyle Busch (driving for The Felon at the time) finished one-two that day. After the race, both cars failed post race inspection for the spoilers being too high. NASCAR, being the unbiased, fair-to-all-competitors they are (Cough! Cough! Choke! Choke! ), allowed the two offending cars to sit for, what, about 30-minutes, then the cars were checked again. They both failed for the spoilers being too high. So, NASCAR let the cars sit for another 30-minutes or so, and checked the two offenders again. The cars then passed. Chad had developed a really neat shock that, every time the car hit a bump, the rear end of the car was raised up slightly. Both cars had these magic shocks. Even Kenny Wallace went on about how high the rear ends of those two cars looked during the post race show that evening. And, as the cars sat, the shocks cooled and bled pressure, allowing the cars to return to the height that allowed them to pass post race inspection. The one comment that stood out was Carl Edwards. “I wish we had of thought of that!” So, watch it before you go demanding Brad be disqualified because the spoiler on his truck was too high. NASCAR set the precedent in 2005. If they never disqualified the two Hendrick cars then, they better not disqualify Brad now, even if he does drive a Ford, the manufacturer NASCAR hates.